Digital UltraViolet and Digital Copy will makes it possible for you to stream the movie Upgrade UV or iTunes Code instantly to your computer and compatible Smartphones, Andriod, iphone, iPod Touch, iPad and tablets devices anytime, anywhere. You can also download a Digital UltraViolet Copy or a Digital Copy of the movie Upgrade UV or iTunes Code to your computer and compatible devices. UPGRADE is a thrilling and hyper violent vision of the future from the producers of GET OUT and THE PURGE, and the creator of SAW and INSIDIOUS. 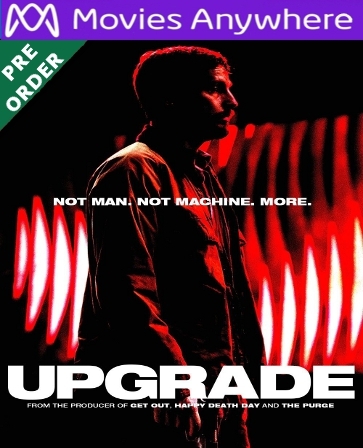 After his wife is killed during a brutal mugging that also leaves him paralyzed, Grey Trace (Logan Marshall-Green, SPIDER-MAN: HOMECOMING, PROMETHEUS) is approached by a billionaire inventor with an experimental cure that will �upgrade� his body. The cure�an Artificial Intelligence implant called STEM�gives Grey physical abilities beyond anything experienced, and the ability to relentlessly claim vengeance against those who murdered his wife and left him for dead.